Relationships created over one's chess career are probably a more important byproduct than the chess itself. Many of us OTB players have a friend or friends that we work with in analyzing games and with whom we travel and room with at tournaments. Your buddy is a sounding board that helps you prepare for that critical game the next round. For about five years Doug Southall and I went to the local major tournaments together. I know you can list many chess buddies who are regulars at tournaments. Chess attracts intelligent people of all various types and backgrounds who are interesting and this adds to the experience of OTB. At the tournament we meet people and talk about a wide variety of things. Being a people person, I get great enjoyment from my chess comrades. And have learned many things about the world and the past based on their experiences. I noticed in internet chess, especially the free chess game sites, many of my opponents are obnoxious. In fact I now play strictly on the ICC because people seem to be civil there. I think the fact you pay money for membership keeps out the riff raff. The importance of this social component should not be underestimated as doctors and psychologists tell us that people who are part of a group and socialize tend be healthier and live longer. So I suggest that you invest in developing these chess relationships. Being a member of a club also enhances this investment. Several years ago when the BCF had to leave the YWCA on Clarendon Street the fearful thought of no BCF flashed into my mind; the loss of the club to chess would have had a chilling effect. What would chess be like if the BCF were to disappear? It takes people investing time and effort into these organizations to make them work. There are some volunteers, but never enough. Being a participating members makes the BCF and chess a better place. I give a great deal of credit to President Paul MacIntyre and the then board of directors who engineered a successful egress from Boston to Somerville. At that time there were no obvious answers about the future of the BCF, and with the help of many people, the BCF survived. Two other mainstays to the BCF are Bernado Iglesias and Robert Oresick who have contributed so much to the BCF. What is your feeling about the social benefit of chess and chess buddies? How about experiences in OTB compared to internet chess? Is membership to a chess club beneficial? These chess camps invite young chess players who already have a complete understanding of the rules of chess to come and develop their abilities. an experienced coach who has been the coach of many of New England’s best young players and has inspired them to many championships. Each camp is $60 for Boylston Chess Club members. Non-members who have never been members before will need to pay to join the club for one year in which case the camp fee is waived. 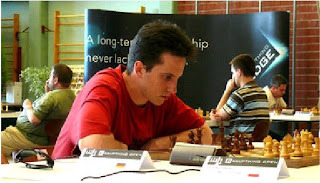 Leonid Kritz (born February 26, 1984 in Moscow) is a German chess player of Russian origin. He learned the game at the age of four from his father. Within six years he was a member of the Spartak sports club where he received his training. In November 1996 he moved with his family to the Saarland in Germany and has won several German championships. In 1999 he won the Youth U16 World Cup in Spain. He received the title of Grandmaster in 2003. In 2004 he took part in the World Chess Championship FIDE in Tripoli. At the Chess Olympiad 2004 and the Euro-team Championship in 2005, he was a member of the German national team. 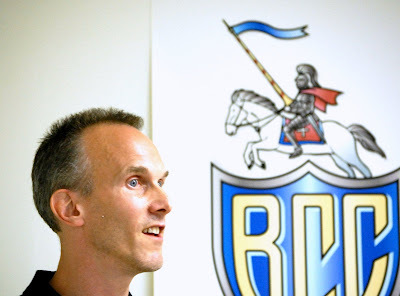 He has been active in 2006, 2007, & 2008 in the Budesliga and in other national leagues. His current FIDE rating is 2609. It is also his peak rating. at (781) 322-7936 or boylstonchess@aol.com. FM Charles Hertan discussed his new New In Chess book with about two dozen fascinated chess players. He described the rationale for his 15 year labor. His enthusiasm for the beauty of combinations was apparent. Hertan argued that the analysis of forcing moves is key to solving problematic and critical situations and that humans have a heuristic bias which may lead them to overlook key combinations. He recommended looking at moves that seem at first glance losing material or time or initiative - which he analogized to "computer eyes" - the brute force calculation of even apparently absurd moves. Chris Chase organized this enjoyable evening. As promised, the über-rich libertarian political activist and philanthropist Rex Sinquefield has created a beauty of a chess club. 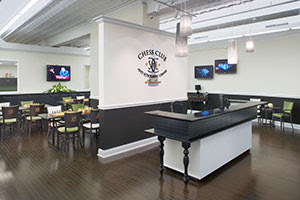 The Chess Club and Scholastic Center of St. Louis, located in the heart of the heart of the Central West End, opens to the public tonight. At a media preview/schmoozefest last night, I contemplated plunking down $80 for the annual membership, just to escape the sticky St. Louis summer in this cool, futuristic world. The décor is black and white -- what else? -- with accents of fashionable chartreuse. Plasma TV sets play in the lobby's huge display window overlooking Maryland Avenue. The basement is equipped with a lounge and classroom, where even the hard-backed chairs get a touch of class: mahogany-color hardwood with a contrasting motif of a king's piece on their backs. Another plasma TV monitor will relay the moves being made by tournament players on the second floor. There, a cluster of freshly matted and framed photographs of famous chess players, mid-think, adorn one wall. A door opens into an even more lavish setting, the board room. Here the chess tables and pieces are handmade by St. James craftsman Nate Cohen. The chairs are high wingbacks, set on zebra-striped and fur rugs. 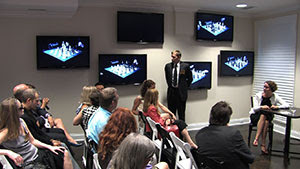 Six plasma screens show close-ups of disembodied hands moving pieces through historic chess matches. It's the work of video installation artist Diana Thater. The $1 million-plus digs are a little surreal, especially when you start talking to the chess aficionados in attendance. Ten-year-olds Joshua Wiedner and Christopher Haberstroh keep gazing around They didn't hesitate to start a game at one of the tables in the lobby, but this room has a museum quality. "It's a really cool place," Haberstroh finally concludes. 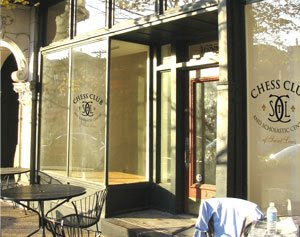 Hearing that story, I wonder whether the long-standing, somewhat grittier Delmar Loop chess (more info here) games will migrate to 4657 Maryland Avenue. The chess club does offer sidewalk tables. I'm told Sinquefield -- who serves on the boards of the Missouri Botanical Garden, Missouri History Museum, Opera Theatre of Saint Louis, Saint Louis Art Museum, Saint Louis Symphony and Saint Louis University (his alma mater) -- is sharpening his game with lessons from an international champion, but I don't learn much else about his personal experience. He asks that I arrange an interview at a later date with his public relations consultant, Laura Slay. Sporting an electric-blue knit shirt, Sinquefield makes a short speech, which reveals his mischievous personality. Tongue in cheek, he says the club will bring "cultural uplifting" to a neighborhood that is so otherwise lacking. "Probably it's going to be known as 'The St. Louis Chess Club: Where egos are shattered on a daily basis,'" he says, grinning. The St. Louis area has a long tradition of chess in schools, but Sinquefield laments that scholastic chess doesn't get enough media attention. The club will lend supplies and volunteers to city schools that want to expand chess programs or start new ones. Sinquefield acknowledges that there's been no "rigorous, scientific study" of the purported benefits of chess, but he'll take care of that, too: The club is sponsoring a five-year study of chess and schoolchildren. "It would be shocking if they didn't show huge discipline and cognitive improvements in children, even if they only stayed in it a few years," he predicts. Tony Rich, a chess player who left his job doing tech support at a major law firm to become the club's executive director, tells me that Mike Podgursky, a University of Missouri economics professor who directs the Show-Me Institute (a libertarian think tank underwritten by Sinquefield), and SLU educational studies professor Michael Grady, are to design and conduct the study. One of the things chess is missing: good nicknames. Boxing has used nicknames forever and it makes for great theater and stories read so much better with nicknames. All positive aggressive macho (for the guys) nicknames. A lot of color would be added to the game if we reported using them. As a perk of a kind, we should probably have a BCF nicknaming committee that bestows nicknames following a player's 5th tournament at the BCF as a member. And we won't use the Animal House lottery system either. speaking of nicknames, Matt can you link to your boston blitz nicknames? Ah yes... here it is... From Nov. of 2006! Josh "Live" Friedel "or Die"
Add others in the comments section! TD Bernardo Iglesias changed the format of the Summer Open to only one day. It was a popular move, more than doubling previous turnouts at the two-day version. IM David Vigorito swept the field of 28. Daniel Shapiro played in his first tournament in 9 years. Dan Leach was in the bunch tied for second, having surpised NM Chris Williams with an upset. So, come, listen and learn a new approach to calculating that very well may make you a better player! Charles Hertan is originally from New Jersey. 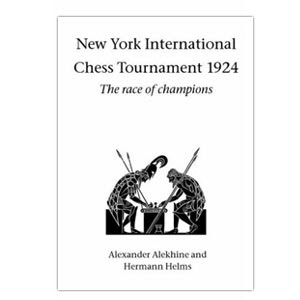 He received his chess "education" playing in New York tournaments during the Fischer boom. He became a master at age 19, and received his FM title and Senior Master rating soon afterward. Charles moved to the Boston area in 1984 and became a fixture in New England tournaments for 16 years, before moving to Western Mass. and retiring from active play. His titles include Massachusetts champion, 2-time New England open winner, 2-time Eastern Class Championship winner, and firsts in several International events including the New York March International in 1986. He has played most of the top American players of the 1970's through 90's including Dzindhichasvili, Alburt, Benjamin, Rohde, Fedorowicz, Ibragimov, both Ivanovs, and many others, and managing the occasional win or draw against many of them. He began the research for my book “Forcing Chess Moves” in 1994. He has also edited a book of poetry and is currently researching a book on Men and Trauma recovery. Books will be available for purchase at the lecture. 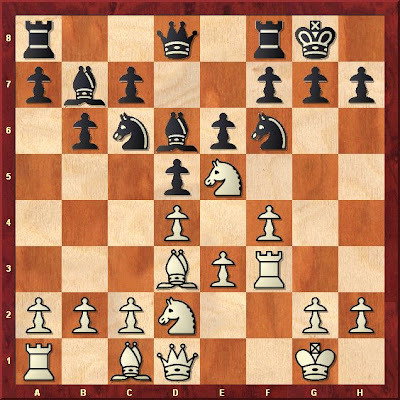 This rich book on chess tactics proposes a revolutionary method for finding winning moves. Charles Hertan has made an astonishing discovery: the failure to consider key moves is often due to human bias. Your brain tends to disregard many winning moves because they are counter-intuitive or look unnatural. "By organizing and explaining the nature of great chess moves Hertan has brought us all closer to being able to find them." "Hertan encourages us to think with 'computer eyes', by first examining all the forcing moves (checks, captures, threats), no matter how daft they seem. Why? Not because forcing moves are always the best, but when they do work, they tend to work better and quicker than non-forcing options." "Hertan develops the reader's skills methodically, thus enabling each tactical lesson to be learned and absorbed properly." "Entertaining and instructive (..) you simply cannot stop looking." "An intensive training course for advanced players to improve their tactical vision and calculation (..) You will increase your tactical striking powers a lot." "This book deserves the highest of recommendations." "This weighty tome is all about improving your tactical play." "Thrilling, instructive and witty. Right on target." "When the clock is ticking away, and you have too many viable candidate moves to choose from, remember Hertan's advice." "The categories in this book are quite unusual." "Develops creative, little explored ideas about how to improve your tactical vision (..) with outstanding positions from master practice." "The price is low for a volume with so many pages and so much content." What is the best way to learn chess? "Any way is good: You'll eventually get to where you have to go." David Dymond was asked that question by a new player and responded in above fashion when the BCF was on Clarendon Street. And for most chess hobbyists, this is probably what we do most of the time. We study in the way that motivates us. Looking here, picking there, avoiding end game study at all costs. Usually we end up spending too much time and money on opening books. But if we have time to invest we will get better. What is the best approach? Being trained as a teacher I took many courses in child psychology and two key lessons learned were: 1. Never force anything on to a child before they are able to handle it. 2. Conversely, press the child to embrace the most complex ideas they can handle because the lower in cognitive development they can master things; the faster and higher their abilities will grow. It's interesting that being a good teacher is being sensitive to the moment a child has moved from not ready to learn, to ready to learn. And because of this point, probably the most effective way for a child to learn anything is to have a good teacher/coach; a person at the ready to recognize the key moment. And if play is involved, many children will be motivated. Because playing is the best medium to learn things. The first time I ever swung a golf club was under the instruction of a golf Pro. It was my grandfather's philosophy that one should never develop bad habits only to have to unlearn them or be stuck with them. I wonder if it's better to learn chess that way? And as some beginners are not children, should the approach vary when dealing with adults? It seems with most players there is the six year window of learning chess: it seems that most people have about six years to get to their level of ability; it holds steady; then progress begins to decline slowly (usually beginning about the age of 63- according to Mark Glickman rating czar of the USCF), as you advance to play your final round. 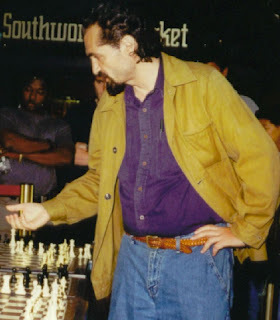 One of my heroes Jim Sfougaris began playing chess at the age of 40 and became an A class player. A very astounding feat. I ask everyone, especially chess teachers, what do you think is the best way to learn chess? Or add any other insights. Please Comment. Round 1 of the Reubens Landey is completed. 12 players, to be joined by Zaroug and possibly Julian Chan (2122), will play next Monday. It is not too late to join in the tournament with a 1/2 point bye. With such a competitive field, you would be sure to have interesting and challenging games. Come play. Bernardo Iglesias directed a field of 27 players in this month's quads at the club, a format that seems to be increasingly popular. FM Chris Chase (3.0) defeated Carey Theil (1.0), Jason Rihel (1.0) and Andrew Wang (1.0). Benedict Smail (2.0) here for the summer from the University of Wisconsin beat Vikas Shiva (1.5), Howard Goldowsky (1.5), and Mika Brattain (1.0). Michelle Chen (2.5) topped her quad, over Adam Yedidia (2.0), Embert Lin (1.0), and Harold Dondis (0.5). David Sculley (2), Danny Moraff (2), and Tony Cortizas (2) pushed Alexander Lee (0.0) to the side and shared the $50 prize. The remaining quad was really a Swiss, dominated by Tony DiNosse (3.0) who ran the table. Chirantan Neogy (2.0), Andrew Liu (2.0), Dr. Nick Afshartous (2.0), Keith Ammann (1.0), Rupayan Neogy (1. ), and Jack Goldsmith (1.0) comprised the Swiss. The comments to my essay about the Spassky Bishop prompted me to discuss dream positions: a position that you wish you could achieve in a game. One of my favorites can be obtained by playing the hedgehog defense where the bishop is finachettoed on b7 the c file is open with a rooks doubled on c7 & 8 and the queen behind the bishop on a8. I saw a Karpov game where he had this setup and I felt it was way cool and wished some day to create this within the context of a game. I waited many years then had the fortune to do it amazingly twice in one tournament!! The first time was against master Lawyer Times vs his Colle, where I beat him in one of my best efforts ever. Ever generous MacIntyre having had several extra copies about, gifted me the 1924 book. Reti won the game against Yates but lost to Lasker. 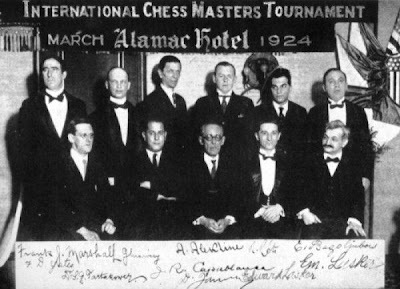 Lasker won the tournament at age 55 losing only one game; his effort in beating the best in the world out of his usual semi-retirement is one of chess's great accomplishments. Hopefully every player will have an opportunity to view Lasker's feat from the old man perspective, as I now do. 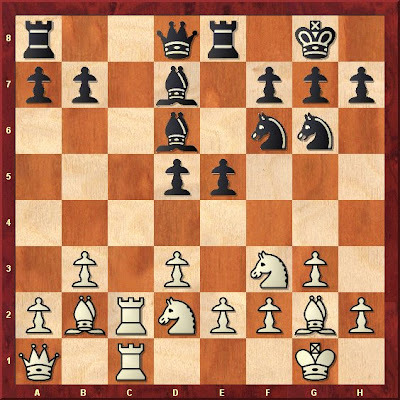 My dream position stems, I think, from reading Fred Reinfeld's Complete Book of Chess when I was a boy. It is the setup below in the Stonewall Attack. From this position I always have the feeling that I can beat anyone. Obviously I don't, but it is always an enjoyable attacking game, with opportunities to sack the Bishop, Rook, or Knight while Black's pieces are helplessly sealed off from the field of action. It is a kind of simple-minded plan - brutally simple and invigorating. It is amazing how often the position arises online or in club play, because an unwary Black can play what seems like natural, reasonable developing moves until he finds himself positionally lost. At least in this case, I agree with Weaver Adams - White is to play and win.